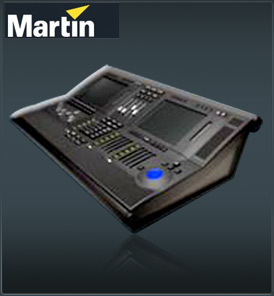 Maxxyz is Martin’s professional lighting console and the most advanced stage lighting console on the market today thanks to a string of highly original features and intuitive design. Maxxyz incorporates all the features that professionals should expect: extremely fast processing power, direct fixture access, powerful effects generator, USB, motorized faders, quality touch screens, along with SMPTE/VITC/LANC/MIDI timecoding. But Maxxyz also offers programmers and LDs a string of impressive features. Maxxyz is one of the first of its kind to incorporate digital LCD buttons designed for tailored, flexible programming. This lets you group functions to an LCD button and customize your console layout to enhance ease of navigation and fast recognition. Maxxyz has been developed with multimedia in mind. The console has a DVD/CD-RW multi-drive so you can synchronize your light shows with audio and video. (The DVD drive is not intended for movie playback and has no DVD Player software). The combination drive also lets you save your shows to CD-ROM. Maxxyz also has a further 39 GB of space available for backup purposes. Along with the 8 DMX universes available directly from the console, Maxxyz is also fully Ethernet enabled. By connecting to a series of EtherDMX boxes, Maxxyz’ capacity expands to 32 DMX universes or up to 32,768 channels. The fast Ethernet network lets you connect to the console from a remote location via PC or laptop. You can also connect to the Internet for software updates, service and support, or to make remote programming modifications from anywhere in the world.